The Serbian-German accordionist and composer Snezana Nešić visited Montreal in autumn 2017 at the invitation of the Goethe-Institut, the Conseil des arts et des lettres du Québec and the Le Vivier group, to complete a two-month music residency. 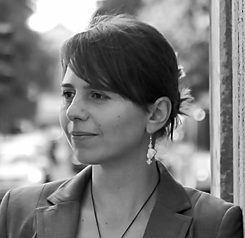 In Montreal, shortly before her return to Germany in December 2017, we had the opportunity to ask Snezana Nešić about her experiences during the residency and her plans for the future. Ms. Nešić, how did your residency in Montreal come about? I heard about the call for applications from a colleague, the Hanover-based Canadian composer Gordon Williamson. I had visited Montreal twice before and already had very positive experiences with the city and the cultural landscape. That’s why I didn’t hesitate to apply for the residency. What experiences did you have in Montreal? What was your collaboration with local partner, Le Vivier, like? I already knew many of the musicians involved from previous collaborations in Montreal. But in the course of this two-month stay, I was able to work even more intensively with local musicians and artists, which also had a very distinct and positive impact on my musical production. I was particularly inspired by collaborating with conductor Veronique Lacroix, but also by the dialogue and collaboration with Ana Sokolovic, Jean Lesage, Olga Ranzenhofer, Jonathan Goldmann, Marie-Chantal Leclair, Jean-Marc Bouchard, Jimmie Leblanc and Symon Henry, to name just a few. Le Vivier, the group that is one of the partners of the residency, has a large network, so that I had easy access to all important information as well as to all of the concerts by the affiliated ensembles. I was really looking forward to presenting the classical accordion to local composers, also in the form of a lecture or workshop at the conservatory in early December 2017. Since the accordion has a very important place in contemporary instrumentation in Europe today, I presented a lot of scores and musical examples and hope for increased use of this instrument in Canadian compositions in the coming years. I was able to perform my own accordion piece at the VivierMix festiv concert on 13 December, which was very well received. The very first piece by a Canadian composer for solo accordion was written by the very important Montreal composer Jean Lesage for me as part of my residency, which, of course, is something very special. I’m really looking forward to introducing this piece to the European audience soon! Veronique Lacroix and Snezana Nešić on December 7, 2017 at "MusiquAvenir“ at the Conservatoire de musique de Montréal | © Almut Klotz You performed with the MusiquAvenir ensemble? How did that collaboration come about? This performance was the result of a direct initiative of Veronique Lacroix, who worked with me on my opera in Montreal in 2015. She found out about my residency and suggested that I conduct one of my works in December, which made me extremely happy. And so, Equilibrion 4, which I specially arranged for her ensemble MusiquAvenir, was premiered. The very great technical skill of the mostly student musicians surprised me and is certainly due to the work of Ms. Lacroix, who is not only one of the most important Canadian conductors of New Music, but also has extraordinary organisational and educational skills. Due to her good preparation, she made it possible to premiere this complex work in a university concert at a high level and with great success. It was a great pleasure for me to play the accordion part in the ensemble, as there are no accordionists in Montreal who have a classical education or experience or who have a professional instrument. Tell us a little about your work – the new piece, Eternal Light, that you are writing during the residency. What role do the city of Montreal and the residency play in the creation of the piece? During my stay I worked on the music theater Eternal Light. My quiet time in Montreal allowed me to work not only on the libretto, but also on the composition of the first act, the 25-minute and musically most complex part of the (altogether 2-hour) music theater. Over these 2 months, I managed a workload that would normally take many months longer. Were your expectations fulfilled by the residency? What advice would you give new participants? My expectations were more than fulfilled in composition as well as in the exchange with my Canadian colleagues. I’d advise them to attend as many concerts as possible during such a residency and to seek contact with local artists from the beginning. This is not only useful because of the exchange of experience, but also for planning future projects and, of course, for mutual inspiration. The Montreal musicians and artists are very well informed and curious – their openness and professionalism, combined with their casual outgoingness, are ideal prerequisites for artistic collaboration and a lively exchange of ideas. First, I’ll continue to work on the music theater Eternal Light. As far as Montreal is concerned, I already have some plans for further collaboration with ensembles and Montreal composers, and for joint concerts and presentations in both Germany and Montreal in 2019 and 2020. We are all already working on making these plans a reality and look forward to seeing each other again soon! Snezana Nešić | © Snezana Nešić Snezana Nešić studied accordion and composition in Kiev and Hanover, where she has been teaching New Music since 2007. She has composed on commissions from the Staatsoper Hannover, the Philarmonie Luxemburg and the Kammeroper Köln, among others, and played as a soloist with the NDR Sinfonieorchester Hamburg and the Staatsoper Hannover. In 2015, her opera The Rain Passed Over was awarded a prize at the Festival Oper’Actuel-Work in Progress. Before her residency in Montreal, she was a scholarship holder at the Goethe House in Rome.